Do your children like going to the zoo? The Wikki Stix zoo animal handprint crafts and songs below are fun extension activities to do before or after a trip to the zoo! If you don’t have an opportunity to visit a zoo, the handprint crafts and songs will provide hours of fun creativity for kids during the summer! The handprint crafts also make wonderful displays, birthday decorations, basic alphabet letter introduction crafts, or gifts to friends! Materials needed: Assorted Wikki Stix (Zebras are black and white, but some children like to be creative and make their zebras from amazing colors), white paper, scissors, pencil, and a child’s hand. Invite the children to trace their handprint with the non-dominant hand onto a piece of white paper (younger children will need assistance in tracing their hand). Set out assorted colors of Wikki Stix and invite the children to create! The handprint can be traced with any color of Wikki Stix and filled in by using additional Wikki Stix inside the original tracing lines. 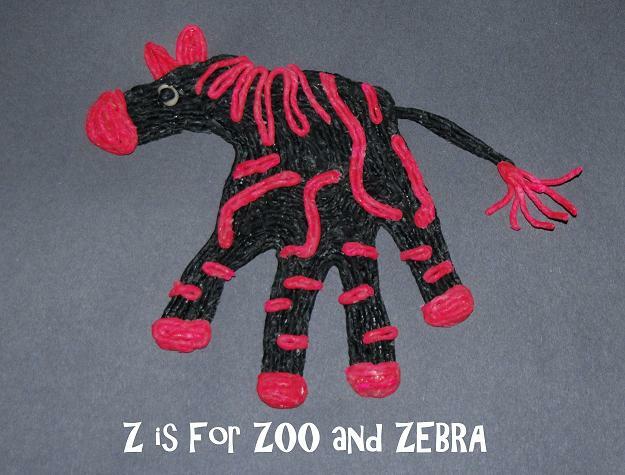 The zebra’s markings can be made using a separate color of Wikki Stix. The children can cut Wikki Stix with safety scissors, but younger children may need assistance. Additional features that can be created: eyes (from white/black Wikki Stix spirals), markings, mane, tail, and hooves. 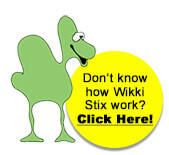 There is no right or wrong way to create with Wikki Stix. Each of the children will create a different zebra that will be as unique as the markings on a zebra they might find at the zoo! Note: For younger children, it may be helpful to print the zebra photo to give them a visual of the various features they might design. I’m a little zebra all white and black (or substitute other colors the children know). Out in the zoo on a summer’s day! Materials needed: Gold or Yellow Wikki Stix, Brown Wikki Stix, scissors, white paper, pencil, and a child’s hand. The Giraffe handprint is a downward facing handprint with the thumb and pinky fingers sticking out to the sides. Younger children will require assistance in tracing their handprint and keeping the 3 fingers together. Older children can trace the handprint with their non-dominant hand. Invite the children to use gold or yellow Wikki Stix to trace the handprint (Note: Super Wikki Stix is great for handprint crafts). The children can fill in the remainder of the handprint with gold/yellow Wikki Stix by placing the Wikki Stix inside of the original tracing lines. 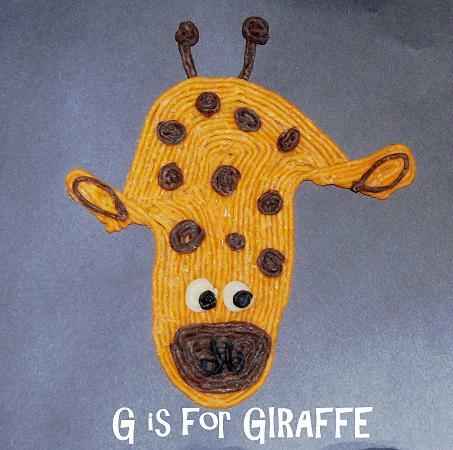 When the giraffe is completely filled in with Wikki Stix, the children can cut small brown pieces of Wikki Stix and make ball or spirals for the giraffe’s markings. The ears of the giraffe are made by folding the pinky finger and thumb parts of the craft upward. Brown Wikki Stix can be cut and used inside of the ears (see photo above). Additional features can be added with Wikki Stix: the ossicones (horn-like features on a giraffe’s head) can be created with brown Wikki Stix and the eyes are created from small white/black Wikki Stix spirals. What can a giraffe see way up high? He can see a MONKEY way up high!! What can an Elephant do with his trunk? What can a seal see underwater? What OTHER zoo animals can your children come up with? Materials needed: Assorted green Wikki Stix (dark and light green), red Wikki Stix, Black Wikki Stix, white paper, a pencil and a child’s hand. The handprint for the alligator requires some fine motor control and practice. Younger children will require assistance to trace the handprint. Have the children practice bending the top of their thumb (this will make the head portion of the alligator). Let the children practice several times. To make the alligator’s mouth, the children should separate the second and third fingers slightly so the alligator’s mouth appears open. Again, it takes practice to open those fingers. Help the children trace the handprint on a plain sheet of white heavy paper. After tracing, the children can outline the handprint with the green Wikki Stix. Invite the children to fill in the alligator by following the original tracing lines with Wikki Stix. The children can made a red spiral by wrapping one strand of Wikki Stix around itself for the alligator’s eye. The iris can be made from a small piece of Wikki Stix formed into a ball. 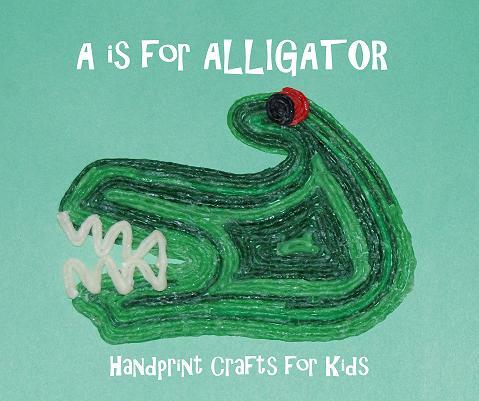 ALLIGATOR ACTION SONG – have the children place their Wikki Stix created alligators on top of a craft stick and sneak around the room opening/closing their arms in a chomping motion. Did you ever see an alligator? An Alligator? An Alligator? Did you ever see an alligator CHOMP this way and that? The zoo-themed handprint crafts will encourage learning and creativity this summer! What other zoo-themed handprint crafts could your kids design with Wikki Stix? Some suggestions might include: elephants, lions, tigers, and birds! We’d love to see the designs your children create with Wikki Stix this summer! You can post them to our Facebook page and we will share with others!